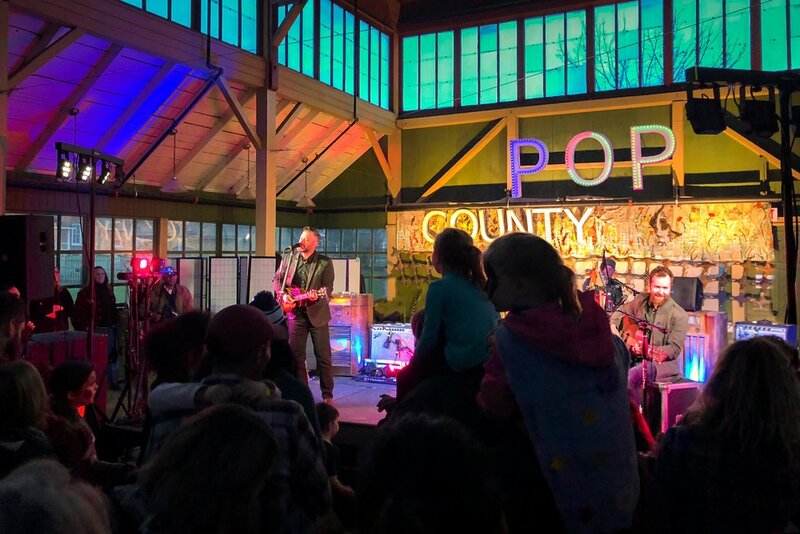 Saturday, April 28, 2018 - This is what it looked like when Miss Emily took the stage at County Pop 2018. The packed crowd inside the beautiful Crystal Palace were ready to see the long-overdue homecoming of local singer-writer Miss Emily, originally from Milford, now recording albums with members of The Tragically Hip! Headliner Elliott Brood capped the night with rousing performance that got the crowd on the feet, and the kids jumping in their capes! A perfect conclusion to a day filled with music, art, food and family. Special thanks to Brent Bodrug, and Jeremy Kelly for running our Songwriter's Stage, doing sound and helping everything run on time! Thanks also to Craig Foster for being our second stage emcee. Big thanks to Yamaha Canada for providing all our second stage sound gear! ART ON STAGE - Thanks very much to Suendrini for creating our 2018 Art on Stage installation. She uses recycled fabrics to create original pieces with environment theme. Meadow Life is the title of the installation she is created for our 2018 County Pop stageo. This year’s creation was her largest up cycled textile installation and will have individually handcrafted wildlife in their natural habitat. Learn more about Suen's work - http://suendrini.com. LEAD SPONSORS - Our lead sponsors provide the financial support that helps us to keep our ticket prices down and we thank them for that! Our lead sponsors this year included Parsons Brewing, County Cider, Lighthall Vineyards, Kinsip Spirits, Honey Pie Hives, and The County. FESTIVAL SPONSORS - Our festival sponsors help us make this event happen and provide the parts to make it work so well. We sincerely appreciate the support of The Regent Theatre, County FM 99.3, The Wellington Times, Outside Music, Exclaim.ca, The Picton Harbour Inn, Frere Du Nord, The June Motel, Vintage Map Co, Books & Company, Humble Bread, PELC, 91X Radio, County T-Shirts. Special thanks to the SOCAN Foundation for their financial support. The event was presented by Zunior.com. VENDORS - Thanks to all of food vendors including PICNIC Food Truck, Vintage Pizza Pie, Idle Wild PEC, Outlet Food Co, PELC Pops!, The Shore Oysters, JK Fries, Chill Zone Desserts and more! Also thanks to our drinks vendors including Parsons Brewery, County Cider, Lighthall Vineyards, Honey Pie Hives, Kinsip Spirits, and Lemonade Dave. STAFF AND VOLUNTEERS - Big thanks go out to the team that worked our front gate all day long including Jen Sills, Charles, Sydney Ullrich and Helen Hawketts. Much appreciation goes to our set up and tear down crew including Steve Mee, Jeremy Kelly and all our front gate team. Thanks to Albert Ullrich for making the Arduino/Bluetooth-controlled County Pop logo, and Bob Ullrich for making the 2018 event commercial. The kids area was sponsored by The County and Krista Dalby from Small Pond Arts, along with Susanne Larner, helped create a band of kids in cool handmade capes and face paint! Thanks to our friends from the ROC 'n Revue who staffed our new Little Rock Room. Thanks to Books & Company for selling tickets, and providing the folding walls (and Vicki Emlaw for getting them onsite). Thanks to Craig McMillan for selling merch. Joel Yearsley from Kingston KSound provided the stage sound, along with help from Rich Taylor. Our backstage artist area was in the capable hands of Nella Casson as our official Sandbanks Music Festival Band Concierge, doing a great job to ensure the musicians had all the essentials. Thanks to Humble Bread, and PICNIC for providing backstage food for our artists. Thanks so much to Sydney and Ruby Ullrich for creating our amazing 2018 poster! Thanks to AVNK Security from Peterborough for helping to make sure the event was safe and secure. A big thanks to Lisa Lindsay, Richard Lightfoot and all the facilities staff at the Crystal Palace for their support before, during and after the show. A tip of the the hat to Chris, Sam and the Parsons team for hosting a gathering at their brewery after the event. Thanks to Lori Farrington, Emily Sanderson, Isabelle Patton, and Helen Hawketts for working behind the scenes for months to help get this event together. PICNIC -> they made the cookies! Please support these businesses and thank them personally for their support of live music in Prince Edward County. Thanks also go to Frere du Nord, Kinsip Spirits and Vintage Map Co for providing additional bonus gifts for our artist swag bags. Prince Edward Learning Centre- The event itself serves to raise funds for Prince Edward Learning Centre, and $1 from every ticket sold goes to support the great work they do for literacy and education in The County. FEEDBACK - We plan to do this again next year on Saturday, May 4, 2019 and we'd love to hear what you thought of the 2018 event, and what you might like to see next year. Feel free to post comments on our social media feeds anytime. We'll continue to post more photos in the coming days on social media using our event hashtag #countypop and we encourage you to do the same. 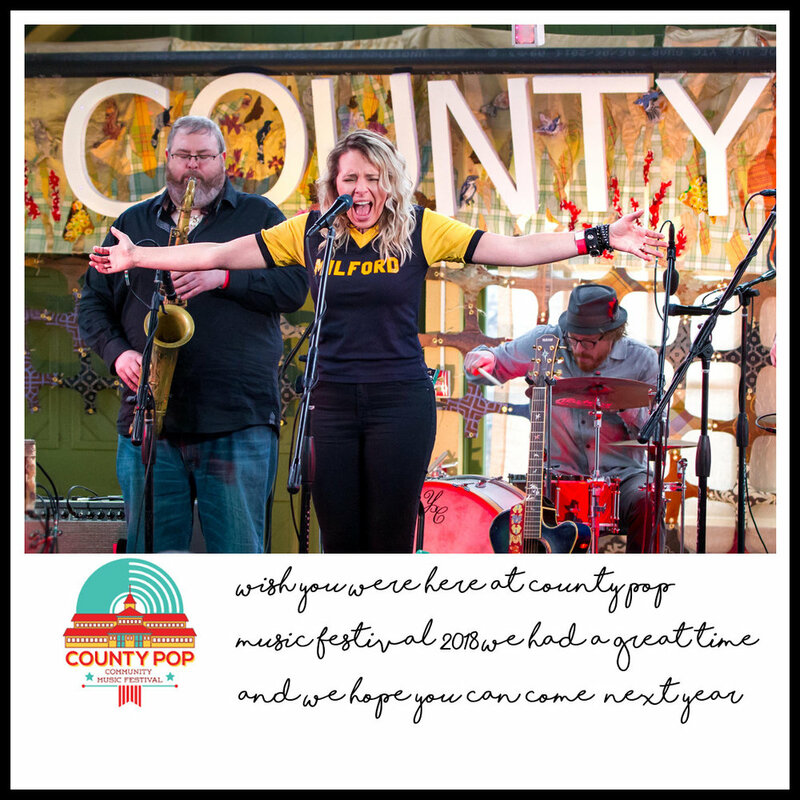 On behalf of the full team at County Pop Music Festival 2018, thanks for coming and we hope to see you again in 2019! Saturday, May 6, 2017 - This is what it looked like when Bill and Joel Plaskett finally took the stage at County Pop 2017. The rain was falling outside but the packed crowd inside the beautiful Crystal Palace were ready to witness a unique musical dream of a father-son combo that was years in the making. Playing songs together and with their backing band The Mayhemingways, the Plasketts took us on a trip through songs new and old. A perfect conclusion to a day filled with music, art, food and family. Special Thanks to Chris Loane for running our Songwriter's Stage, doing sound and helping everything run on time! ART ON STAGE - Thanks very much to our Art on Stage installation provided by Suendrini. She uses recycled fabrics to create original pieces with environment theme. Her work for County Pop 2017 was entitled 'Long View Wonder' which was inspired by the golden James Webb Space Telescope (JWST) and honeybees with their honeycomb hives, it places a spotlight on the scope and depth of the informed scientific consensus based upon truths that will echo for generations. Learn more about Suen's work - http://suendrini.com. LEAD SPONSORS - Our lead sponsors provide the financial support that helps us to keep our ticket prices down and we thank them for that! Our lead sponsors this year included McKinney Re/Max, Parsons Brewing, Karlo Estates, County Cider, and The County. FESTIVAL SPONSORS - Our festival sponsors help us make this event happen and provide the parts to make it work so well. We sincerely appreciate the support of The Regent Theatre, County FM 99.3, The Wellington Times, Bay of Quinte Tourism, Outside Music, Exclaim.ca, The Drake Devonshire, The Picton Harbour Inn, Frere Du Nord, Vintage Map Co, Books & Company, Kinsip Spirits, Mix 97, PELC, 91X Radio, County T-Shirts. The event was presented by Zunior.com. VENDORS - Thanks to all of food vendors including Pizza Via, PICNIC, The Shore Oysters, and Lemonade Dave. Also thanks to our drinks vendors including Parsons beer, Karlo Estates wine, County Cider, and Kinsip Spirits. STAFF AND VOLUNTEERS - Big thanks go out to the team that worked our front gate all day long including Jen Sills, Tammy Thompson, Sydney Ullrich and Helen Hawketts. Our front door greeter was Nicola Crenna. Much appreciation goes to our set up and tear down crew including Nick Ullrich, Steve Mee and all our front gate team. Thanks to Albert Ullrich for making the Arduino/Bluetooth-controlled County Pop logo, and Bob Ullrich for making the 2017 event commercial. The kids area was sponsored by The County and Krista Dalby from Small Pond Arts, along with Treese Moore, helped create a band of kids in cool handmade capes and face paint! Joel Yearsley from Kingston KSound provided the stage sound, along with help from Rich Taylor. Our backstage artist area was in the capable hands of Sheila Hughes as our official Sandbanks Music Festival Band Concierge, doing a great job to ensure the musicians had all the essentials. Thanks to Humble Bread, Pizza Via and PICNIC for providing backstage food for our artists. Thanks so much to Ken Hudson from County T-Shirts for creating our amazing 2017 poster! Thanks to AVNK Security from Peterborough for helping to make sure the event was safe and secure. A big thanks to Lisa Lindsay, Richard Lightfoot and all the facilities staff at the Crystal Palace for their support before, during and after the show. A tip of the the hat to Chris, Sam and the Parsons team for hosting a gathering at their brewery after the event. Thanks to Lori Farrington, Emily Sanderson and Helen Hawketts for working behind the scenes for months to help get this event together. PICNIC -> they made the 'County Pop' cookies! Humble Bread -> they made the bagels! We've got a few 2017 County Pop t-shirts left and we're selling them for cheap! On behalf of the full team at County Pop Music Festival 2017, thanks for coming and we hope to see you again in 2018! This is the first cut of our 2016 video time capsule featuring photos taken by you! Thanks for submitting your shots and using our hashtag #countypop on social media. Speaking of photographers, we were so impressed by how many of you came out this year that we are going to add a special music photography element to the event next year. Stay tuned for that! We've got just a few County Pop 2016 t-shirts left and we're looking to sell them all! For just $10, you can buy one of these in a variety of the usual sizes for pick-up/purchase in downtown Picton at either PELC (206 Main St, Picton - (613) 476-1811), or Books and Company (289 Picton Main St, Picton -(613) 476-3037). $1 from every shirt will go to support PELC! Send a note to dave@zunior.com if you have questions, or simply drop by PELC or Books and Company today! So again, for just $10, you can buy one of these in a variety of the usual sizes for pick-up/purchase in downtown Picton at either PELC (206 Main St, Picton - (613) 476-1811), or Books and Company (289 Picton Main St, Picton -(613) 476-3037). $1 from every shirt will go to support PELC! Thanks for your support this year! I love it when a plan comes together! Thanks so much to everyone for your support of our first-ever County Pop this past Saturday at the Crystal Palace! Everything went so well and the feedback on the event has been so positive. This event was truly all ages, and it was so great to see families dancing, singing and simply hanging out on a such a beautiful day with the clear daylight streaming onto those historic walls of the Crystal Palace. - Jen Sills and AJ Clark for their volunteer assistance as greeters/helpers at both the North and East gates. - Annelise Noronha for volunteering as our Stage Manager and technical stage assistant. - Krista Dalby and Suzanne Larner for running our kids area, sponsored by The County. - Our food vendors including The Drake, PICNIC, Jamie Kennedy Fries, Pink Lunch Pail, PELC Pops! Popcorn and County Cupboard Lemonade. - Ian Pattison from the Banjo Mechanics for doing such an amazing display of his custom hand-crafted banjos. - County T-Shirts for doing our event poster and t-shirts. - Joel Yearsley for doing sound. - Our beverage sponsors Norman Hardie, County Cider and Barley Days Brewery. - Key sponsors that helped us spread the word about the event including County FM 99.3, The Times, The Gazette, The Bay of Quinte, The Regent Theatre, Books & Company. - Isabelle Patton for helping collect all the great stuff in our swag bag. Also thanks to all our swag bags participants. Click here to read the full list! - FACTOR Canada for their sponsorship support. We acknowledge the financial support of Canada's private radio broadcasters. - Flyby.ca and my brother Bob for helping us with our County Pop commercial. - The amazing upcycled textile art that framed our County Pop stage painstakingly hand-created by Suendrini Goonesekera - http://suendrini.com. - The super cool led-fired and Arduino-controlled County Pop sign/lettering created by my brother Albert. - The Crystal Palace staff for helping us run a safe, clean and fun event in such a beautiful building. - $1 from every ticket purchased went to support the work of the Prince Edward Learning Centre. Thanks to them for supporting efforts to provide adult learning opportunties in PEC, and thank you for buying a ticket! - All of our artists including the Banjo Mechanics, Instant Rivalry, Communism, Justin Rutledge and Ron Sexsmith. Our local guest artists included Mark Despault (played with Banjo Mechanics and Instant Rivalry), Jeremie Albino (played with Communism) and Jeremy Kelley (played with Justin Rutledge). - Finally, I'd like to thank Lori Farrington, Helen Hawketts and Emily Sanderson for helping with event organization and execution on so many different levels, with so many different tasks. Speaking directly with so many of you on Saturday, it was so great to hear your stories, comments and suggestions. Please keep them coming anytime by sending a note to dave@zunior.com. I'd love to know what you thought we did well, and what you think we could do better. Want to buy a 2016 County Pop t-shirt for only $10? Click here. $1 from each sale goes to PELC! Also - Take a look at the first cut of our 'County Pop 2016 Photo Time Capsule' featuring the best pictures from the day. We believe that local business is the engine that drives growth and creates jobs in The County. We created our free County Pop Swag bag to provide an avenue for allow local County business owners to let you know about their business by promoting upcoming offers/products/events heading into the busy summer months. Thanks for your support of these local County businesses and County Pop!